Oregon has the opportunity to take a bold step in the fight against climate change and accelerate the transition to a clean energy future. Passing the Clean Energy Jobs bill is the most important thing Oregon can do this year to address climate change. Clean Energy Jobs caps and reduces Oregon’s rising climate pollution and accelerates our transition to clean energy. By investing in clean energy and money saving solutions in the communities that need it most, the Clean Energy Jobs bill would strengthen Oregon’s economy and support the urban and rural communities across Oregon hit first and worst by climate change and polluting fossil fuels. The climate crisis is already harming the Oregon we love, yet there is currently no mandatory requirement that we meet our state climate goals. Oregon is far off track from meeting our state climate goals for 2020 and beyond. 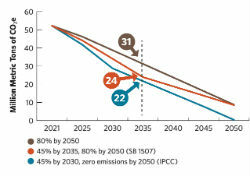 The bill would set aggressive goals to reduce climate pollution by at least 45% by 2035, and at least 80% by 2050. More than 10 years in the making, the Clean Energy Jobs bill creates a climate program similar to successful programs in 10 U.S. states and in countries around the world. With the Clean Energy Jobs bill, the biggest sources of climate pollution in Oregon pay their fair share – addressing the current failure of our laws that allow major industries to emit unlimited climate pollution for free, while the public pays for the costs of climate change. Using the proceeds from corporations paying their fair share, Oregon can invest in clean energy strategies that will strengthen our economy through innovative technology, more resilient infrastructure, and jobs and workforce training in growing industries with good, family-wage jobs. The bill puts a hard limit on climate pollution from the largest sources in Oregon, primarily from fossil fuels, responsible for 80-85% of the state’s greenhouse gases. The cap on climate pollution lowers annually to get Oregon on track to meet state climate goals. Regulated businesses will hold permits (called “allowances”) to pollute, and the state will auction a limited amount of these permits. Regulated businesses have flexibility to find the lowest cost way to meet the limit, by either reducing their emissions or paying for permits or other emissions reductions. The price on pollution is designed to be relatively stable, and starts relatively low (appx. $16/ton in 2021) to help businesses transition to the low carbon future. As the number of permits reduces over time (with the declining cap), the price per permit rises – sending a long-term signal to big emitters to find the least-cost way to reduce greenhouse gases.